When your back hurts, it seems that your whole body is affected. Standing for too long causes pain, but so does sitting. Sitting becomes uncomfortable, so you try walking. But then that hurts again. You take some ibuprofen and feel some relief after a while, but then you have to bend and twist to drive your car and the pain returns with a vengeance. Ibuprofen and other medications may provide you with temporary relief. 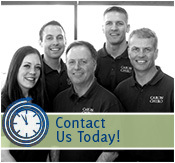 Caron Chiropractic Clinic PA provides effective, long-term back pain relief. Caron Chiropractic Clinic operates on the principle of helping the body heal itself. Our staff works with you to find the best possible treatment plan to relieve you of your current back pain. Further, we work with you to ensure that your back pain comes back as infrequently as possible. If it does return, we will work with you to encourage your body’s long-term healing ability. This often results in the duration of your pain being shorter and less severe. One of the best known treatments for effective back pain relief is chiropractic care, or spinal adjustments. This treatment realigns the vertebrae in your neck and back when your spine is misaligned. In addition to spinal rehabilitation, our team also offers ArthroStim, which is a technique that supplements spinal adjustment. ArthroStim can be used when we have identified the specific problem area in your back. We can place you in the position in which you experience discomfort and provide adjustment while you are in that position. ArthroStim is highly effective in such cases. Massage therapy is also an effective treatment for back pain. In addition to relieving pain at the specific site of injury, massage therapy has the added benefit of providing overall release of tension. That in turn encourages your body to heal. Massage therapy has a positive effect not only on the muscular and circulatory systems of our bodies, but also on the nervous system, immune system, and lymphatic systems. The benefits of massage therapy demonstrate how chiropractic care encourages healing more generally. Another treatment option we employ to provide effective back pain relief is acupuncture. Acupuncture targets specific points on the body. It involves the insertion of fine, sterilized needles in pressure points. Finally, if your back pain is caused by or returns because of issues with posture or body alignment, we can also fit you with orthotics in your shoes to ensure that you walk in a way that discourages back pain. Caron Chiropractic Clinic PA can provide you with options and a combination of options for effective relief of back pain. To schedule an appointment, call us at (651) 255-9999. This entry was posted	on Friday, February 1st, 2019 at 10:50 am	and is filed under Back Pain, Chronic Pain, Massage Therapy. You can follow any responses to this entry through the RSS 2.0 feed. You can leave a response, or trackback from your own site.